Railpictures.ca - John Pittman Photo: The head end of CN train 421 emerges from tree cover, rolling westward out of Aldershot Yard approaching CN Snake (Road) where it will rejoin the CN Oakville Sub. Usually 421 departs from here too early in the morning for me. Powering the train are CN 5758 (GMDD SD75i), CN 2007 (GE Dash 8-40C) and CN 2444 (Dash 8-40CM Draper taper cowl). For those who know this spot, cooler weather has diminished the local tick hazard, but precautions are still advisable. Only wildlife seen was a garter snake. | Railpictures.ca – Canadian Railway Photography – photographie ferroviaire Canadienne. Caption: The head end of CN train 421 emerges from tree cover, rolling westward out of Aldershot Yard approaching CN Snake (Road) where it will rejoin the CN Oakville Sub. Usually 421 departs from here too early in the morning for me. 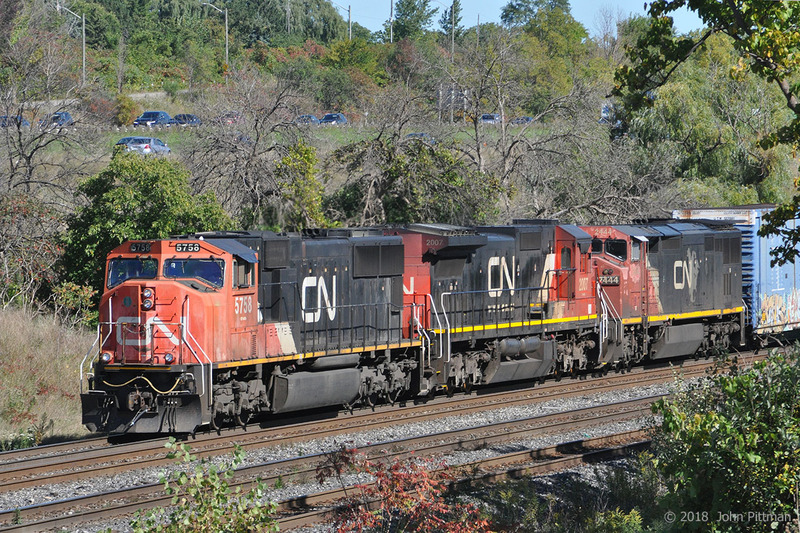 Powering the train are CN 5758 (GMDD SD75i), CN 2007 (GE Dash 8-40C) and CN 2444 (Dash 8-40CM Draper taper cowl). For those who know this spot, cooler weather has diminished the local tick hazard, but precautions are still advisable. Only wildlife seen was a garter snake.